Jou Jye Venus 3.5" SATA Hard Drive Enclosure, USB 2.0/SATA - "XBox Colors"
We're cleanin' house, so bring your wads of digital cash to our little e-Garage Sale! 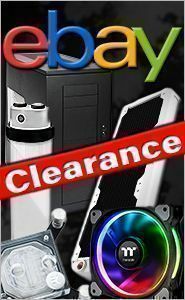 You'll find all kinds of random stuff here; cases, watercooling and fans to name a few. Stuff gets damaged sometimes in a huge warehouse like this, so our clumsiness is your gain. Check back often, as we'll be adding product to this section regularly until it's all cleared out. First come, first served. If an item disappears from this section, it's all gone! Note: There is no warranty included with these products -- Sorry, no returns! You bought it, it's yours! If something's missing, it was missing from the box to begin with. What you see in the pics is exactly what you'll be getting; no more, no less. Some product may look rough, but they're functionally sound. Cases may be missing stuff. They may be bent; they may even be rusty. But they work. Some could even be used as a basis for a mod project. Fans are all brand-new system pulls from mod projects, etc. Don't worry, you won't get a dusty used fan, okay? Relax; radiators were individually tested for leaks, so I don't wanna hear any gripes!